Explore the two areas most devastated by the eruption of Mount Vesuvius in 79 A.D., Pompeii and Herculaneum. 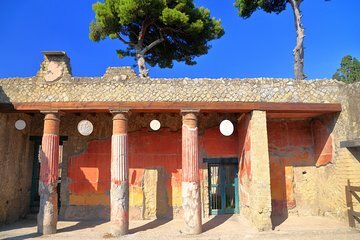 This half-day tour explores the two archaeological sites where visitors can see the remains of the cities such as shops, the Forum, the courthouse, thermal baths, the Temple of Augustali, and more. Spend 2 hours at each site and learn about the daily life of the ancient Romans from your informative guide. This was the most amazing tour we have ever had,Paola was extraordinary. It was well worth the extra cost. He was patient and extremely knowledgeable. We spent over 7 hours with him. We definitely do it again. Giancarlo was fantastic! All three of the children 11,11,14 had a great time. He had so much patience with my daughter's questions. The adults loved the tour as well. We spent all of dinner taking about the tour and how it wouldn't have been as good without Giancarlo. We had four different tours during our vacation - This was the best! Having an Archaeologist as your guide definitely makes the difference. Since coming back to the States, I've told everyone about this tour and how it is a Must Do!